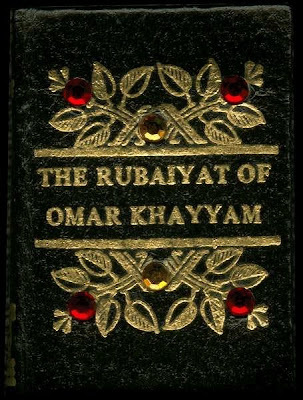 One of the dearest and most delightful of the books I have in my collection is an early edition of Edward FitzGeralds translation of the Rubaiyat of Omar Khayyam, a refinement of some of the 600 or so "Rubaiyat's" (quatrains) written by the great, but forgotten by time, Philosopher, Astronomer and Mathematician. Dealing as it does with existence, with a simile of life as time spent drinking wine from life's cup, in a garden: (Dreaming when Dawn's Left hand was in the sky / I heard a Voice within the Tavern Cry, / "Awake, my Little ones, and fill the cup, / Before Life's Liquor in its cup be dry"). I thought it good to bring it to the Knights attention, not least for its beautiful words, but also its history to this present time is one of extraordinary good fortune and "Kismet" in its own right. For what slight details we possess of the life story of this great Persian poet we are almost entirely dependant upon his friend and patron, Nizam al Mulk. From him we learn that Omar Khayyam (Khayyam = a tent maker) was born at Naishapur in Khorassan around the middle of our 11th century, and died within the first quarter of our 12th century. This Nizam was a schoolfellow of the poet's at Naishapur, and in after years rose to eminence in the State, becoming Vizier to the Sultan Alp-Arslan. In accordance with a compact made in old Collegiate days, so the legend runs, Omar came one day to the Vizier to claim an interest in his good fortune, and was granted the boon he asked - sufficient provision to enable him to devote himself to the pursuit of Knowledge. He afterwards attained to a very high degree of proficiency, especially in the science of Astronomy. This, together with his skill in versification, brought Omar a notoriety that was far from being an unmixed blessing, for, though the Sultan showered favours upon him, Omar, for some reason or other, never became popular with the multitude. Omar's views of Fate, Freewill, Existence, and Annihilation, could but offend the extravagant Mystics of his time. Today, though his philosophy, inclining as it does to the negative and lower side, may jar apon the feelings of some, all may admire the beauty of the muse, the symmetry of the style, and the brilliance of the imagination, enshrined in the great poem which fitly combines the genius of the Persian philosopher and that of the English poet. When FitzGerald received from his friend Cowell the transcript of a rare Oriental Farsi manuscript, which he had found in the Bodleian Library in Oxford, he probably did not foresee the immense interest which it was destined to call forth, the story of the First edition in 1859, is one of the romances of the the history of Literature. The book was issued at five shillings by Quarilch, but owing to its pronounced failure it was not long before it was relegated to a box at the publisher's door in which books were offered at one Penny. Among the purchasers from this box was the pre-Raphaelite artist Dante Rossetti, who took the copy home and read it to a circle of friends, which included Swinburne and others; and it was owing to the influence of these choice spirits that the poem won that popular appreciation which it now enjoys. Where I made one - turn down an empty glass. "Ahhh, I got kin in that body! If that dog between you legs is barking? Our own Dead Poets Society?